As the temperature and moisture content of paved roads change over the course of a day and course of a year, the structural characteristics of the pavement layers also change. Those changes affect how well the pavement responds to traffic loads and thus how long the the pavement will last. However, the magnitude of those changes and the relationships involved are not well understood, making them difficult to address with any degree of confidence during the design and evaluation of pavements. What are in the SMP CD-ROMs? This section briefly describes what the seasonal monitoring program is, how it evolved, what sort of data it provides, and the intended purposes of the data. The tutorial walks the user through the steps involved in accessing the SMP data. Two videos produced by the North Carolina Department of Transportation and the Colorado Department of Transportation have been digitized and included. The videos document the installation of the instrumentation of the LTPP SMP test sections in the two referenced States. 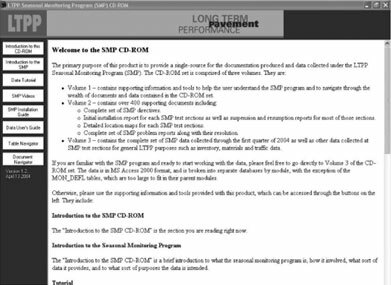 The "LTPP Seasonal Monitoring Program: Instrumentation and Data Collection Guidelines, Report FHWA-RD-94-110, April 1994" contains detailed information on the SMP instrumentation and their installation as well as the detailed SMP data collection requirements. The Pavement Performance Database (PPDB) Data Users Guide provides a background to the LTPP PPDB as a whole, including SMP data, and describes productive methods of interacting with the data, including detailed examples. The Table Navigator provides an easy and fast way to browse the IMS data structure. It represents the IMS as a three-tiered structure of tables, fields and codes. When first started, the Table Navigator shows the user a complete list of all the tables in the IMS along with the tables' description and owning module. This list can be sorted and searched with the use of the controls at the bottom of the form. The search features include drill-down searches of included field names and field descriptions. Double-clicking on a table brings up a list of the fields included in the table along with the units, description, and code types (if any) relevant to those fields. This list can also be sorted and searched by using the same tools at the bottom of the window. If a field contains codes, the complete list of those codes can be brought up by double-clicking on that field. The "Back" button at the bottom of the form allows the user to move backwards from the codes list to the fields list and from the fields list to the tables list. The Table Navigator also supports export of any displayed information into fixed-width text, comma separated values (CSV, useful for import into spreadsheets) or HTML. The Document Navigator allows indexed access to the over 400 supporting documents located in Volume 2. When first started, the Document Navigator displays a list of the categories of documents available in the upper right. By selecting a category of documents, the State code list is populated with the State codes of test sections with documents available in that category (if a category of documents applies to all test sections, the value will be listed). Likewise, selecting a State code will cause the SHRP_ID list to be populated with all the applicable test sections in the State. Once the test section is fully specified, the titles of available documents will be displayed. Selecting a title will list the document subsections. Once the sub-section is selected and clicked, the selected section will open in a new Adobe Acrobat® window.